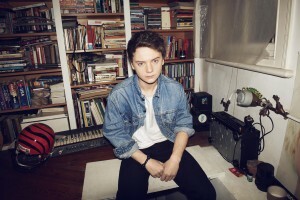 Conor Maynard. ©EMI. CR: David Titlow. HOLLYWOOD—Nineteen-year-old British singer-songwriter Conor Maynard is gearing up for the release of his first U.S. single, “Vegas Girl,” with a video that premieres today on VEVO. A multi-track EP for “Vegas Girl,” which includes remixes by Wideboys and Tortuga and a cover of Drake’s “Marvin’s Room” is available for pre-order and will be delivered July 24. “Vegas Girl” is available at http://www.vevo.com/watch/conor-maynard/vegas-girl/GB0401200096. Written and produced by Maynard and the U.K. production team the Invisible Men (Jessie J, DJ Fresh), “Vegas Girl” is the first track to be released in the U.S. from Conor’s upcoming debut album, “Contrast,” due from Capitol Records Sept. 18. The up and coming futuristic-sounding urban-pop singer hails from the British seaside town of Brighton. He grew up listening to Michael Jackson, Stevie Wonder, Usher and Justin Timberlake, and began uploading videos of himself singing his favorite songs to YouTube in 2008. With the encouragement of friends and family, along with the overwhelming positive response from his video clips, he posted a range of hits that showcased his soulful voice, including Chris Brown’s “Crawl” (which Brown raved about when he Tweeted the link). He also has covered Taio Cruz’s “Dynamite,” Rihanna’s “Only Girl” and Ne-Yo’s “Beautiful Monster,” which racked up millions of views. Both Ne-Yo and Cruz were so impressed with Maynard’s performance that they each contacted him at home and offered to produce and sign him. Since then, Maynard has been in the studio working with Ne-Yo, Jermaine Dupri (who has produced for Usher and Mariah Carey), Stargate (Katy Perry, Rihanna), Midi Mafia (50 Cent, Frank Ocean), Kevin Rudolf (Jay Sean, Lil’ Wayne), Sandy Vee (Rihanna, Pitbull), Crada (Drake, Kid Cudi), songwriter Diane Warren, the Invisible Men (who also produced Maynard’s debut U.K. single, “Can’t Say No,” which debuted at No. 2 on the U.K. singles chart) and Pharrell Williams. Maynard currently is the focus of VEVO’s emerging artists program, LIFT and earlier this year, the teen won MTV U.K.’s “Brand New For 2012” Award (beating out such artists as Lana Del Rey) thanks to overwhelming voter support from his fans, who call themselves “Mayniacs.” With 90 million views combined YouTube views (including 9.2 million for “Can’t Say No”), Conor has the seventh most subscribed music channel in the U.K. He has also amassed 415,000 Facebook “likes” and more than 304,000 Twitter followers.